Aim is to make the best 5 card low hand, Ace counts as low and Pairs, Straights and Flushes count against your low hand. Triple Draw Poker is an interesting poker game which although not widely played has risen in popularity over the last few years. In 2004 the World Series of Poker introduced a Deuce to Seven Triple Draw event to its schedule and it is now a regular feature each year. Draw poker is a variant of poker that is based on each player being dealt a complete hand before the betting rounds commences. Each player then tries to improve their hand in later rounds by replacing or “drawing” cards. Triple Draw Poker is named after the number of drawing rounds available to players so each player has 3 rounds in which they can replace or “draw” cards. Triple Draw can be played in different varieties such as 2-7 Triple Draw (deuce to seven) or A-5 Triple Draw (Ace to Five). The most common form played is Deuce to Seven Triple Draw. 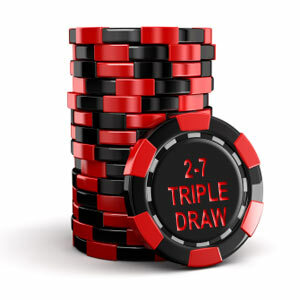 2-7 Triple Draw is another poker variation where the lowest poker hand wins – this is sometimes referred to as “lowball”. So… How do you play 2-7 Triple Draw Poker? Each player will receive five cards face down from the dealer which only that player can see. The aim of the game is to get the lowest five card hand with all cards of different numerical value. During the hand each player will have the opportunity to swap any, all or none of their five cards with each drawing round. There are three drawing rounds per hand. The big difference with 2-7 triple draw compared with other games requiring the player to get the lowest hand is that Ace is counted as high and straights and flushes count against your low hand. The best possible hand you can get is 7 – 5 – 4 – 3 – 2 that are not all of the same suit. Notice that the 6 is missing so the cards do not form a straight (5 cards running in sequential order). The first three cards 9-8-6 are equal. Player One holds the lowest fourth card with a 3 and so would be the winner of this hand. The Dealer Button is a marker that goes around the table one position at a time in a clockwise rotation before the start of every hand. Once the dealer button has been placed in front of the correct player for that hand then the two players immediately to the left of the dealer button must place “Blind Bets” into the pot. The player seated to the left of the dealer button will put in the small blind and the player seated next to his left will put in the big blind. The big blind amount is usually double the amount of the small blind. The size of the blinds are determined by the stakes that are being played. The stakes at a table will be referred to with two numbers, for example $0.50 / $1.00. In this example the small blind would be $0.50 and the big blind would be $1.00. Once the Blinds are in the pot each player will receive five cards face down which only they can see. The cards will be dealt first to the player to the left of the dealer button and last to the player with the dealer button in front of them. After all players have received 5 cards then a round of betting will commence. The player to the left of the dealer button will always be the first player to act. During this first round of betting the small blind and big blind have already placed a blind bet into the pot so in this round we start with the player to the left of the big blind. Fold – the player can fold which which means their cards are discarded and that player will take no further part in the hand. 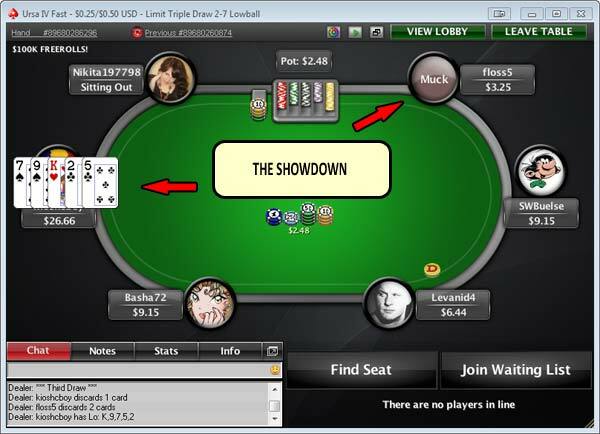 Call – the player can call which means they put in the same amount of chips as the player acting before them. If nobody has raised then the amount to put in will be the same as the big blind amount. Raise – the last option is to raise which means that player puts in more chips than the current bet and everyone else must then match this bet to continue in the hand. This will continue with each player taking their turn to act in a clockwise rotation until all players who remain in the hand (have not folded) have put an equal amount of chips into the pot. Once the first betting round has finished all of the remaining players are given the option to swap any number of the cards in their hand. There is no limit to how many cards can be swapped, a player may swap all 5 cards if they so wish. Players may also choose to not swap any cards which is known to “stand pat”. Once all players have chosen the number of cards to draw in order to try and improve their hand a second round of betting commences starting from the first active player to the left of the dealer button. Each player has now had two chances to Draw and Bet. A third and final round now takes place where once again the players can draw cards and at this point all players will know what their final hand will be. Then a final round of betting takes place. Once the final betting round has finished all remaining players in the hand must reveal their cards to determine who wins the pot. The player with the best low poker hand will be awarded the winners pot. If the hands are tied then the pot will be split equally between all players that are tied. 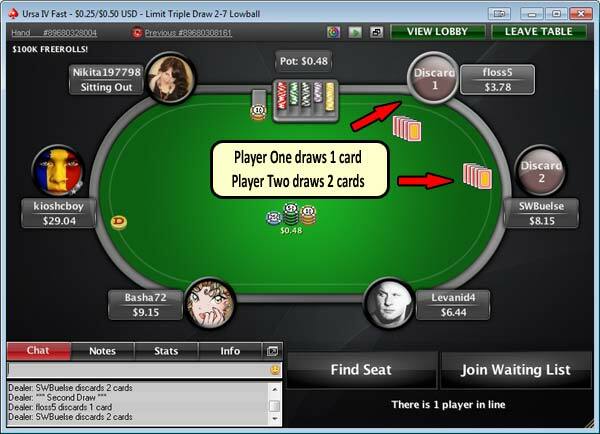 Triple draw Poker can be a real change to the other games of poker that players might be more familiar with. It is a totally different structure and style of game and can be refreshing and entertaining. 5 Card Triple Draw is not as popular as other variants online so you need to ensure that you choose an online poker site that has Draw tables running. If you want to try 2-7 Triple Draw then you should head over to our Play Poker section where we can recommend to you an online poker site that is trusted and also offers Draw Poker games. Practise is the best way to learn, so pick a low value stakes 2-7 Triple Draw table and just experiment until you get used to all the stages above.